To understand the Kinsman Redeemer, you need to understand something about the culture of the time in both the Christian and Hebrew Scriptures. The people had certain beliefs sometimes based on the Word and sometimes not. For instance, if someone was born blind they believed that the person may have been reincarnated and came back blind for past misdeeds. Notice this wasn’t people who had no understanding at all; this was Jesus’ disciples asking this curious question. If he had sinned and was thus born blind, the only possible explanation is that these disciples believed he had lived before. Of course, there is no basis for that in the Hebrew Scriptures, but some people believed it anyway. When you first started studying the Word of God, you may have had some preconceived ideas about it. You might have believed God was vindictive, or that the Genesis account of creation was a myth, or any of many false doctrines. If you read the above verse in John, the only possible explanation for this question is they believed in reincarnation. Even though it was not true, God still has to deal with us from where we are at. He can tell us a truth and we can mentally assent to the truth, but in our hearts we hold onto the myth. It can take a great deal of time to overcome a lie you have been taught as a truth. There is another record I want you to notice; because it directly relates to the subject we are looking at. It is important to the understanding of the book of Ruth that you understand when a man and woman got married it was their obligation to have children and if possible male children. They were looking for an heir to inherit land and money involved. This is why it was seen as a curse if people only had daughters because in the culture they would have to pay a dowry to the family of the male she would marry. If I, being a man, got married to a woman and we had no children and I died, it would, in biblical culture, be the obligation of my brother to then marry my wife and to raise up a family for me. That is why the Sadducees asked this question trying to trip up Jesus Christ because they did not believe in the resurrection. In fact that is an easy way to remember the difference between the Pharisees and the Sadducees. The Sadducees don’t believe in the resurrection that is why they are so, Sad-u-see. I’m not teaching this whole record in Matthew, instead I put this here as an explanation and now we are ready for Ruth Chapter 1. There is a great deal more in the Hebrew Scriptures, just look up the word kinsman in a good concordance. 1 NOW it came to pass in the days when the judges ruled, that there was a famine in the land. And a certain man of Bethlehemjudah went to sojourn in the country of Moab, he, and his wife, and his two sons. 2 And the name of the man was Elimelech, and the name of his wife Naomi, and the name of his two sons Mahlon and Chilion, Ephrathites of Bethlehemjudah. And they came into the country of Moab, and continued there. 3 And Elimelech Naomi’s husband died; and she was left, and her two sons. 4 And they took them wives of the women of Moab; the name of the one was Orpah, and the name of the other Ruth: and they dwelled there about ten years. 5 And Mahlon and Chilion died also both of them; and the woman was left of her two sons and her husband. So Naomi went with her husband and 2 children unto Moab. Now while there, her husband died. It becomes the responsibility of the son, to take care of the mother, at this point. The oldest son becomes the head of the household. So when Joseph died Jesus then became the head of the household. It was his responsibility to take care of Mary his mother. At the crucifixion you may remember Jesus looks at the disciple whom he loved and said to Mary “Woman behold thy son” This was Jesus fulfilling his obligation to his mother to make sure she was taken care of. That is why some believe that this un-named disciple may have been James the Lord’s brother. He would be next in line to take the responsibility of taking care of her. That of course is just conjecture because we are never told who this disciple was. So the two sons then marry Orpah and Ruth. Now the two brothers die so there is no male to take care of the three women. Women in this predicament were taken in the husband’s family which we see later on. Ruth 1:6 and 7 (KJV) 6 Then she arose with her daughters in law, that she might return from the country of Moab: for she had heard in the country of Moab how that the LORD had visited his people in giving them bread. 7 Wherefore she went forth out of the place where she was, and her two daughters in law with her; and they went on the way to return unto the land of Judah. So Naomi decides to return to Bethlehemjudah. Ruth 1:8 and 9 (KJV) 8 And Naomi said unto her two daughters in law, Go, return each to her mother’s house: the LORD deal kindly with you, as ye have dealt with the dead, and with me. 9 The LORD grant you that ye may find rest, each of you in the house of her husband. Then she kissed them; and they lifted up their voice, and wept. Naomi seems to have been a very practical woman. She tells her daughters-in-law to return to the house of their parents so they can find rest with another husband. 10 And they said unto her, Surely we will return with thee unto thy people. 11 And Naomi said, Turn again, my daughters: why will ye go with me? are there yet any more sons in my womb, that they may be your husbands? So Naomi asks them to go back because she is past the age where she will remarry and have more children. So she will have no more sons there may not be anyone to marry these women. 12 Turn again, my daughters, go your way; for I am too old to have an husband. If I should say, I have hope, if I should have an husband also to night, and should also bear sons; 13 Would ye tarry for them till they were grown? would ye stay for them from having husbands? nay, my daughters; for it grieveth me much for your sakes that the hand of the LORD is gone out against me. Ruth decides she isn’t going. Ruth set an example of believing or of trust we can follow. She had accepted Naomi as her family and just like we should forget that which is in the past, she tells Naomi thy people will be my people and thy God shall be my God. 17 Where thou diest, will I die, and there will I be buried: the LORD do so to me, and more also, if ought but death part thee and me. 18 When she saw that she was stedfastly minded to go with her, then she left speaking unto her. Naomi finally realized Ruth was going to go with her no matter what she said. What an example this woman is to us. She forsook all that she knew and loved and committed herself to her mother-in-law. We need to do this with God, forget ourselves and live for God, doing that which God commands us to do. 19 So they two went until they came to Bethlehem. And it came to pass, when they were come to Bethlehem, that all the city was moved about them, and they said, Is this Naomi? 20 And she said unto them, Call me not Naomi, call me Mara: for the Almighty hath dealt very bitterly with me. Again this is not God’s doing in fact it was the Devil at work here as we will see. 21 I went out full, and the LORD hath brought me home again empty: why then call ye me Naomi, seeing the LORD hath testified against me, and the Almighty hath afflicted me? 22 So Naomi returned, and Ruth the Moabitess, her daughter in law, with her, which returned out of the country of Moab: and they came to Bethlehem in the beginning of barley harvest. So Ruth and her mother in law get to Bethlehem and everyone seems to be suffering from wagging tongue disease. They are talking about Naomi because of her circumstance. Now it was time to harvest the barley. Let’s see what Chapter 2 has to say. So Boaz was a relative of Naomi from her husband’s family. Remember now it is the husband’s family that would be next to take the responsibility after all the brothers of a dead husband. 2 And Ruth the Moabitess said unto Naomi, Let me now go to the field, and glean ears of corn after him in whose sight I shall find grace. And she said unto her, Go, my daughter. 3 And she went, and came, and gleaned in the field after the reapers: and her hap was to light on a part of the field belonging unto Boaz, who was of the kindred of Elimelech. The word “hap” in verse 3, is a noun, meaning “one’s luck or lot,” [An occurrence, happening, or accident], for our purpose it means unplanned meeting. This is just the way people greeted each other at the time. If we met we would say hi. They greeted each other this way. They kept God first in everything that they did. We could learn a great deal from this if we keep God first in all our relationships maybe there wouldn’t be as many problems as we now have. 5 Then said Boaz unto his servant that was set over the reapers, Whose damsel is this? 6 And the servant that was set over the reapers answered and said, It is the Moabitish damsel that came back with Naomi out of the country of Moab: 7 And she said, I pray you, let me glean and gather after the reapers among the sheaves: so she came, and hath continued even from the morning until now, that she tarried a little in the house. This is the same as someone saying they want to give back to the community. When they harvested the crop there was always some left behind, this would be left so that the poor could go behind the reapers and clean up the small stuff. There would always be seed left behind or in the case of corn the less than good ones. These were left for those who had not. Not only is Boaz letting her glean after them but he tells her not to go someplace else and she can abide with the female help. She has a place to stay. So Boaz tells the reapers to leave her alone and let her glean and don’t stop her. She also has permission to drink from the same vessel or pitcher that the help used. This was not a normal occurrence, the gleaning yes, but the people waited till the reapers left an area before they went in. This was a sign of reverence when you fell at the feet of someone and kissed their feet. You may remember Cornelius fell at Peter’s feet when Peter came to his house. It showed respect for the person you were dealing with. It was a sign of surrender to someone. Now if you kissed the feet that is asking for forgiveness if you did something wrong. 11 And Boaz answered and said unto her, It hath fully been shewed me, all that thou hast done unto thy mother in law since the death of thine husband: and how thou hast left thy father and thy mother, and the land of thy nativity, and art come unto a people which thou knewest not heretofore. 12 The LORD recompense thy work, and a full reward be given thee of the LORD God of Israel, under whose wings thou art come to trust. Sound a bit like 1 Corinthians 15 when it talks of us after the return of Christ? 13 Then she said, Let me find favour in thy sight, my lord; for that thou hast comforted me, and for that thou hast spoken friendly unto thine handmaid, though I be not like unto one of thine handmaidens. 14 And Boaz said unto her, At mealtime come thou hither, and eat of the bread, and dip thy morsel in the vinegar. And she sat beside the reapers: and he reached her parched corn, and she did eat, and was sufficed, and left. Now this was a complete brake with culture. No gleaner would ever be invited to eat with the master. Just being told she could drink the water of the handmaidens was going way beyond the normal walls within the culture. 15 And when she was risen up to glean, Boaz commanded his young men, saying, Let her glean even among the sheaves, and reproach her not: 16 And let fall also some of the handfuls of purpose for her, and leave them, that she may glean them, and rebuke her not. 17 So she gleaned in the field until even, and beat out that she had gleaned: and it was about an ephah of barley. 18 And she took it up, and went into the city: and her mother in law saw what she had gleaned: and she brought forth, and gave to her that she had reserved after she was sufficed. 19 And her mother in law said unto her, Where hast thou gleaned to day? and where wroughtest thou? blessed be he that did take knowledge of thee. And she shewed her mother in law with whom she had wrought, and said, The man’s name with whom I wrought to day is Boaz. 20 And Naomi said unto her daughter in law, Blessed be he of the LORD, who hath not left off his kindness to the living and to the dead. And Naomi said unto her, The man is near of kin unto us, one of our next kinsmen. The word kin just means family but the word kinsman means redeemer. He was a redeemer because when the wife’s husband dies he was one of the relatives who would be a person to marry the woman. The men who would marry the widow were referred to as redeemers because they would take away the “reproach” (Look that word up someday in a good concordance) of the women. It would be seen as the woman was redeemed because she could now bare a son. 21 And Ruth the Moabitess said, He said unto me also, Thou shalt keep fast by my young men, until they have ended all my harvest. 22 And Naomi said unto Ruth her daughter in law, It is good, my daughter, that thou go out with his maidens, that they meet thee not in any other field. 23 So she kept fast by the maidens of Boaz to glean unto the end of barley harvest and of wheat harvest; and dwelt with her mother in law. 1 Then Naomi her mother in law said unto her, My daughter, shall I not seek rest for thee, that it may be well with thee? 2 And now is not Boaz of our kindred, with whose maidens thou wast? Behold, he winnoweth barley to night in the threshingfloor. 1 One day Naomi her mother-in-law said to her, “My daughter, should I not try to find a home for you, where you will be well provided for? 2 Is not Boaz, with whose servant girls you have been, a kinsman of ours? Tonight he will be winnowing barley on the threshing floor. 3 Wash thyself therefore, and anoint thee, and put thy raiment upon thee, and get thee down to the floor: but make not thyself known unto the man, until he shall have done eating and drinking. 4 And it shall be, when he lieth down, that thou shalt mark the place where he shall lie, and thou shalt go in, and uncover his feet, and lay thee down; and he will tell thee what thou shalt do. To show surrender you had to touch the feet so if they were covered you had to remove the covering. 5 And she said unto her, All that thou sayest unto me I will do. 6 And she went down unto the floor, and did according to all that her mother in law bade her. 7 And when Boaz had eaten and drunk, and his heart was merry, he went to lie down at the end of the heap of corn: and she came softly, and uncovered his feet, and laid her down. 8 And it came to pass at midnight, that the man was afraid, and turned himself: and, behold, a woman lay at his feet. 9 And he said, Who art thou? And she answered, I am Ruth thine handmaid: spread therefore thy skirt over thine handmaid; for thou art a near kinsman. The word Skirt is the mantel. Ruth was asking Boaz to redeem her from the curse. It would mean Boaz would protect her. If Boaz does this she has a kinsmen redeemer. 10 And he said, Blessed be thou of the LORD, my daughter: for thou hast shewed more kindness in the latter end than at the beginning, inasmuch as thou followedst not young men, whether poor or rich. 11 And now, my daughter, fear not; I will do to thee all that thou requirest: for all the city of my people doth know that thou art a virtuous woman. 12 And now it is true that I am thy near kinsman: howbeit there is a kinsman nearer than I. There is another relative who would have the first right to marry Ruth. So Boaz has to make sure that this relative is willing to give up his right to have Boaz become her redeemer. They were not obligated to marry her because they were not brothers. 13 Tarry this night, and it shall be in the morning, that if he will perform unto thee the part of a kinsman, well; let him do the kinsman’s part: but if he will not do the part of a kinsman to thee, then will I do the part of a kinsman to thee, as the LORD liveth: lie down until the morning. 14 And she lay at his feet until the morning: and she rose up before one could know another. And he said, Let it not be known that a woman came into the floor. 15 Also he said, Bring the vail that thou hast upon thee, and hold it. And when she held it, he measured six measures of barley, and laid it on her: and she went into the city. 16 And when she came to her mother in law, she said, Who art thou, my daughter? And she told her all that the man had done to her. 17 And she said, These six measures of barley gave he me; for he said to me, Go not empty unto thy mother in law. 18 Then said she, Sit still, my daughter, until thou know how the matter will fall: for the man will not be in rest, until he have finished the thing this day. So Naomi and Ruth have to sit and wait it out to see what this other kinsman will decide. Pretty evident Boaz tells the other kinsman to have a seat and let’s talk. He asks the elders from the gate the judges to join them so this is all legal and above board. 3 And he said unto the kinsman, Naomi, that is come again out of the country of Moab, selleth a parcel of land, which was our brother Elimelech’s: 4 And I thought to advertise thee, saying, Buy it before the inhabitants, and before the elders of my people. If thou wilt redeem it, redeem it: but if thou wilt not redeem it, then tell me, that I may know: for there is none to redeem it beside thee; and I am after thee. And he said, I will redeem it. So Boaz says that there is this parcel of land that Naomi has that you can buy because that is your right as a near kinsman. So he asks him if he wants to buy it. Now he tells him that he will have to marry Ruth as well to get the land. Whoever buys the land will also be buying the wife. So there you have it the other kinsman cannot buy the wife or won’t buy her so now it’s all free and clear for Boaz. I don’t know how they came up with this but a shoe had to be exchanged as proof of this contract. So there you have the account of Boaz and Ruth. With all those customs from the times they lived in. I said it would be apparent why this was all so important, look down at verses 21 and 22 below. 12 And let thy house be like the house of Pharez, whom Tamar bare unto Judah, of the seed which the LORD shall give thee of this young woman. 13 So Boaz took Ruth, and she was his wife: and when he went in unto her, the LORD gave her conception, and she bare a son. 14 And the women said unto Naomi, Blessed be the LORD, which hath not left thee this day without a kinsman, that his name may be famous in Israel. 15 And he shall be unto thee a restorer of thy life, and a nourisher of thine old age: for thy daughter in law, which loveth thee, which is better to thee than seven sons, hath born him. 16 And Naomi took the child, and laid it in her bosom, and became nurse unto it. 17 And the women her neighbours gave it a name, saying, There is a son born to Naomi; and they called his name Obed: he is the father of Jesse, the father of David. 18 Now these are the generations of Pharez: Pharez begat Hezron, 19 And Hezron begat Ram, and Ram begat Amminadab, 20 And Amminadab begat Nahshon, and Nahshon begat Salmon, 21 And Salmon begat Boaz, and Boaz begat Obed, 22 And Obed begat Jesse, and Jesse begat David. This was the Devil trying to cut off the believer’s line. If Boaz and Ruth had not married who knows if the line would not have been cut off. If that line was cut off we would never have been redeemed, but I’m sure, God would have had another plan, had this one failed. 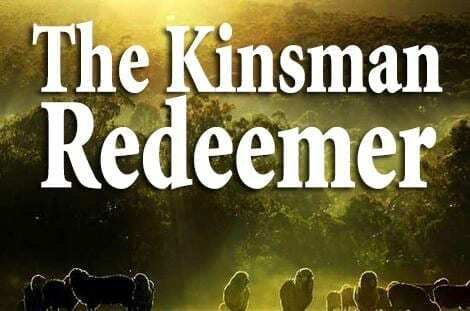 There is a good deal more about the kinsman redeemer if you get your concordance.